I am sure you guys all love freebies! I know I do! Since Halloween is almost upon us we’ve partnered with Matt from Echo Enduring Media to create a new breed of Twitter bird. Sure we all appreciate the cute and adorable Twitter bird icons and graphics, but there’s a new kid in town. He’s mean. We call him Tweevil, the dark Twitter bird. All the files are in AI, ESP, PNG and PDF formats so it’s perfect for scaling or if you want to edit or tweak them to fit your designs. Those vector illustrations are free for personal and commercial use and a license file is included in the zip. These are awesome, really nice work… post more if you end up designing anything else. Thanks for all the comments everyone! This was a really fun pack to make and Jon was great to work with! @Jake – I certainly hope to be able to produce some more freebies for SpyreStudios in the future! 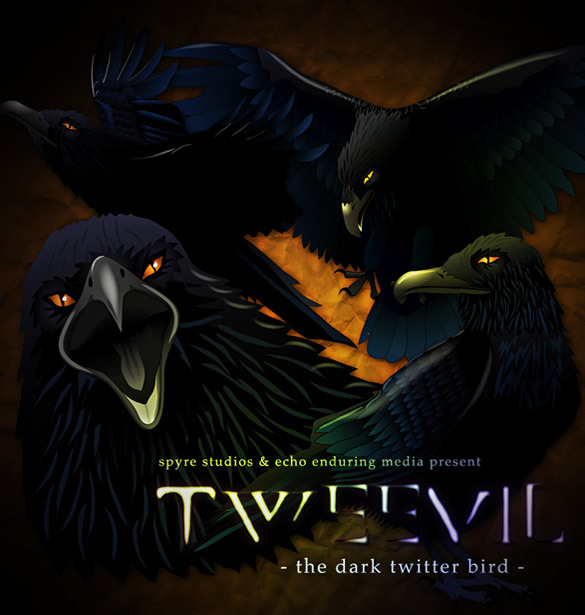 Love the graphics and the whole dark twitter bird concept! Oh, thats pretty cool and absolutely something for me! Thanks for sharring! Reminds of a Crow. Nice work. halloween couldn’t be more dashing…. thanx for the icon, mate!! nice! lol I think I have the perfect design for this. I’m going to try something out. I’ll email you if I end up using it. Nice vector set – not sure if Twitter are all that evil though lol. Very nice. I like the night theme which has great background light in it.